Explore the 1863 Union Army post at Camp Reynolds, a real Civil War era army camp, become recruits to the Union Army, and try your hand at baking army bread and learning other soldierly skills. There will be exciting mock battles between Union and Confederate forces each day by historic re-enactors and park volunteers on the parade ground. There will be two skirmishes on Saturday and one on Sunday. 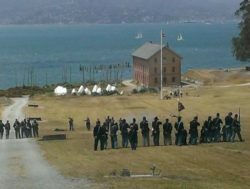 Re-enactors bunk overnight in historic buildings on site, with beautiful views of San Francisco Bay. During the weekend, there will be infantry and artillery demonstrations, period baking, map making demos, and a special event for the re-enactors on Saturday evening. The event is free to attend, but the cost of ferry to Angel Island varies according to where you take off from.